On February 9, 1950, Sen. Joseph McCarthy launched the Red Scare, raising fears of communist influence in the United States. 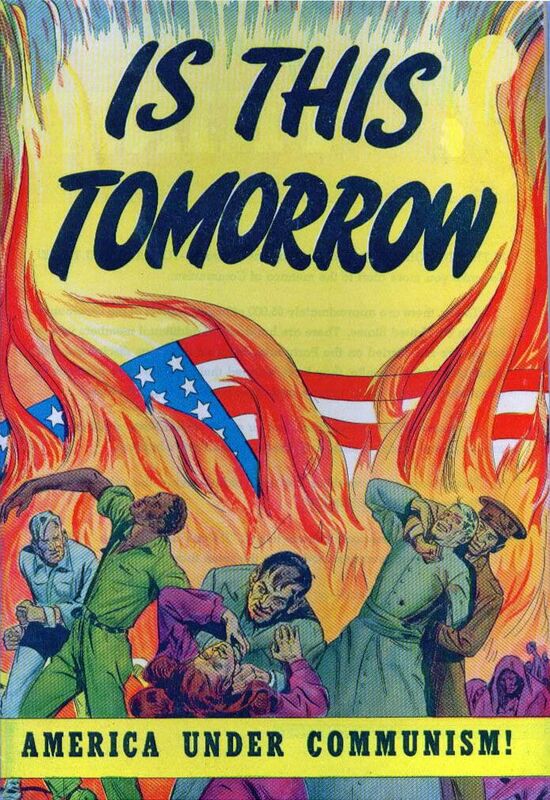 This 1947 pamphlet produced by the Catholic Catechetical Guild Educational Society was part of a "Red Scare" in the U.S. that raised fears about the horrors of a communist takeover. On February 9, 1950, Wisconsin Senator Joseph McCarthy made a speech to the Republican Women’s Club in Wheeling, West Virginia, in which he accused members of the U.S. Department of State of being communists. The so-called “Wheeling speech” launched a period of “McCarthyism”—a “Red Scare” that did not end until the late 1950s. McCarthyism targeted individuals for having socialist or communist sympathies. The Soviet Union, the Cold War enemy of the United States, had a communist economy. People accused of being communists were suspected of being disloyal to the U.S.
Thousands of teachers, writers, union supporters, and government employees were “blacklisted” and lost their jobs after being accused of supporting communism. Celebrities, too, were accused, including musician Leonard Bernstein, civil rights activist W.E.B. DuBois, and physicist Robert Oppenheimer. to blame or charge with a fault or crime. list of individuals or organizations suspected of disloyalty or wrongdoing. department of U.S. government responsible for international relations, whose mission is to "Create a more secure, democratic, and prosperous world for the benefit of the American people and the international community." McCarthyism Noun the practice of making accusations of disloyalty, often without proof or based on slight, doubtful, or irrelevant evidence. Red Scare Noun spreading of fear about the potential rise of communism. person who supports greater community control of the production and distribution of goods and services. union Noun organization of workers formed to protect the rights and interests of its members.